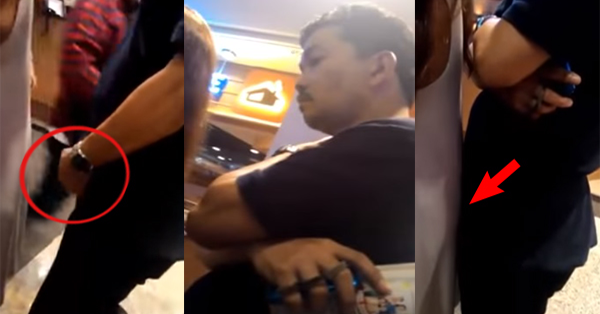 WATCH THIS: You Will Be Irritated on What This Guy Did to an Innocent Girl in Public! Nowadays, we heard different stories of women who are victims of opportunist and ungentlemen. This type of exploitation is fast increasing, especially in crowded areas where women, who wear attractive outfits, are the most common that is why some men are getting thrilled to do immoral behavior. Because of this, people are used to catch videos of perverted acts and immediately upload to social media sites in order to make everyone aware and at the same time teach the suspect a lesson. This video is so annoying. A man used to get closer to a woman who was busy watching an activity in the mall. While watching, the man, acting like he was watching too, was trying to stick his private part behind her back. The innocent girl was so unaware of what the guy was doing. This 'evil moves' has been taken by a concerned citizen and uploaded it on YouTube. Very disappointing, isn't it? Even though he did not touch the girl, his act showed his intention and he may be filed charges related to violence. Women should be aware of what is happening around so that they will not be taken advantage by others. Ang sakit sa nose ng article na ito. Practice pa ng mabuti. juskocolored. sakit nga sa ilong.